Bender: I’m so embarrassed. I wish everybody else was dead. With widescreen, flat panel monitors becoming increasingly common, it becomes more difficult to make a solid decision as to which to purchase, and what to look for. While ultimately it comes down to personal preference, the Samsung 2243BWX offers up some nice features and superior performance that combined with an affordable price make it worth taking a good look at. 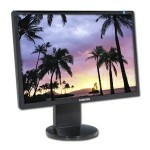 The first thing you’ll notice with this monitor is it’s sleek look and large screen size. Especially for those of you upgrading from older CRT or smaller LCD monitors, this will be a huge and noticeable upgrade. Even for those that have larger screens already, this monitor offers up a slick presentation as well as Energy Star compliance. The buttons to access the On Screen Display or OSD as well as the power button are flat and part of the bottom edge of the screen. You won’t have an extra “button” to push at all in fact, just push on the area of what you want to do, power, OSD, etc, and the monitor detects the force of your finger. The majority of the built in features are fairly standard for what is being offered. The OSD offers up the usual brightness and contrast, as well as position and color options. There is also an auto adjust feature to allow the screen to center itself according to the data it receives from your computer. It offers both a VGA and a DVI connection, that’s analog and digital for the less geeky folks in the audience, or blue and white plugs, for the extra non geeky! There are USB ports located on the stand rather than the front or side as some monitors, which depending on how you have the height adjusted means you will either have no problem at all, or the ports could be blocked by the screen itself. Beyond that, the monitor is one of the very few larger LCD screens on the market that comes with a matte background as opposed to a glossy background. This is extremely useful for those that find themselves in an area with lots of light as it significantly reduces glare. Overall, the Samsung 2243BWX is a very nice, high quality monitor for the fairly low price compared to comparable monitors out there. It might not have the absolute top of the line features, but often those end up not being used with the monitor just being used well, as a monitor. If you’re looking for a good high quality monitor for a decent price, definitely consider this one. Sorry to go a bit off topic but can anyone suggest a good kitchen firm in the United Kingdom.